Treasury Secretary Jack Lew has a brief op-ed in Friday's USA Today arguing the need for Congress to raise the debt ceiling without reservation before the Oct. 17 deadline. 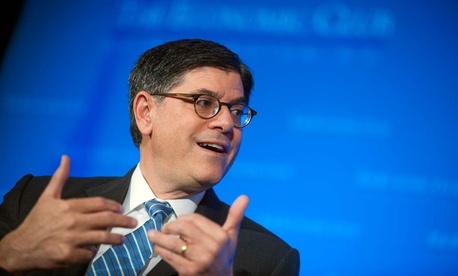 The fallout of the United States not being able to pay its debts will likely be far-reaching although Lew's op-ed speaks in terms more broad than specific. We cannot put our nation in the position of not paying its bills because Congress has refused to raise the country's debt limit. It is important to note that increasing the debt limit does not give the government the ability to spend more money. An increase in the debt limit simply allows us to pay our bills. Without a debt limit increase, our government will -- in a matter of days -- not have the resources it needs to make good on its commitments. Only Congress has the power to lift the debt limit. That means only Congress can clear the way for our government to meet all of its financial obligations. Lew also addresses the House of Representatives's current strategy of passing piecemeal continuing resolutions and forcing the Senate to vote down any a la carte funding measures, stating that the Obama administration's hard line of all or nothing is the only way to avoid morally ambiguous prioritization. Some claim that the United States does not need to meet every one of its commitments. They argue that the government could pay certain bills and let others go unpaid without consequences. The United States cannot be put in a position of having to choose which commitments it should meet. How could we possibly decide among supporting our veterans, maintaining food assistance for children in need, or sending Medicare payments to hospitals?